It was one of those sunny afternoons when cabs were scarce. I didn't fancy the 2 minutes and counting wait at the junction but I had to get to school. Good thing was that I wasn't alone ; we were about 15 waiting and then this red bus came into view. It was a familiar one with the university's name inscribed on it and the driver was ready to give as many of us as he could a jolly ride to school. I was reluctant at first but when I thought about the sun, I hopped in. As the bus started moving, I began to feel uncomfortable not only because of the passers-by looking in but also because I was sitting by the window. During the journey that seemed very long, I remembered the two ladies I had offered my seat to because I knew they had an exam that afternoon and I didn't and how they had refused and then the look in their eyes. Or maybe I imagined that? When we finally got to school, I started praying that the driver would stop at a location far away from people's view. I kept praying till we passed this place I wanted and he finally parked somewhere that well, wasn't so bad. The good thing about sitting by the window that moment was that I got to leave the bus first after appreciating the really kind gesture of the driver. Later in the day while thinking of the day's events, I remembered the bus and how being in it had felt and I wondered why I felt that way. It suddenly didn't make much sense anymore. Feeling uncomfortable because I was in a bus with the words 'Physically Challenged Students' written on the outside. Funny how certain people go through this routine every other day. Getting pitiful looks and stares from people not only when they're seen in the bus but also when they walk around as one. Living with the varying degrees of looks wherever they find themselves. Scratch the looks, the cold treatments are worse. It's just sad, really. To be honest, when I realised that I could have gotten down from the bus with crutches or something worse, I was just weak. Speaking of crutches, I had to use them sometime back - probably 2010. The day I was to have my leg cast, I remember being in the waiting room of the Orthopedic section, surrounded by people either using crutches and this other stuff I have no idea what it's called and I kept hoping my scan results wouldn't require any of those but then it did. My left leg was put in a cast and I had to be wheeled to where the car was. I definitely didn't find the glares funny. Even when the cast was finally removed, I still had to depend on the crutches for few days after which I started using a knee cap corrector because I had to be in school for an external exam. I didn't appreciate the way people always stared at the blue thing on my knee, trying to figure out what it was. I didn't appreciate the questions from teachers and seniors. I didn't appreciate the overall attention but one thing I enjoyed was the fact that I could get to the dining hall late and not have to kneel down. - Be thankful for every little thing. Not just as a state of mind now but deliberately mention them. - Let's try to cut down on the seemingly pitiful glares. They aren't appreciated. - Don't treat others any less just because you seem to be more fit than they are or you have something they don't. Because..
- So much can happen in a day! When I left home that day, I had no idea I wouldn't be walking in on my own. 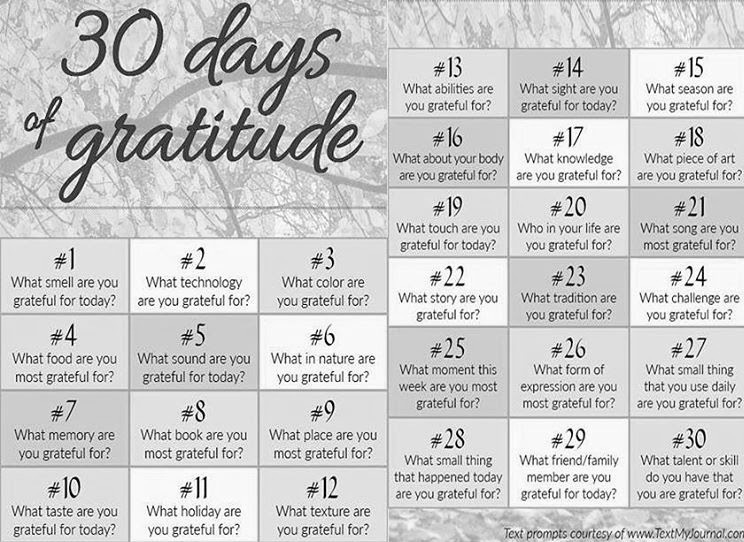 Two days after I drafted this post, I read Kachi's post on Ways to be more grateful in our everyday life and she asked for those who were interested in a Gratitude Challenge. I definitely was because this is no coincidence. I started quite late but it's been fun so far as I not only get to be introspective but also get to think back through 2016 and count my blessings till the year runs out. It's never too late! You can join in using this picture which makes it easier as a guide. I usually have so many questions to ask after each post, right now I don't but How are you guys and what are you grateful for? It's funny how we tend to take the little things in our lives for granted. I remember growing up, I should to wish for a lot of things and I still remember the look on my mum face when she would lecture me on appreciating the ones I've already instead of asking for more. It took me a while but I finally understood my mum and all the things she was trying to tell me. I'm thankful each day for the gift of life and also for my family and friends. I think you are one of those who do not like or fancy attention... Help can come from anywhere. That's how God designed it for us. Where you do not expect at all. I already had an article written down to post on this same topic: APPRECIATION, but still wondering how to twist it because i posted it on my former blog which is no longer functioning. So, when i finally do it, i will definitely make a link to this your story as backlinks so others can also read this post too. Great post OLA..and very inspiring too. Wow, great story. It's like you read my mind on this. I'm publishing a post soon on being grateful for the little things. I enjoyed reading this Ola. Hi Olaa. I really should do this coz I'm facing a few challenges at the moment and it gets really easy to complain and seem ungrateful. We really should be grateful for those things we regard as little. For the fact that we wake up everyday to a new dawn is enough to be grateful. Thanks for sharing. This post was beautiful Ola. I've been reading gratitud\de posts all around lately. First it was Kachee's, then Oyindamola's and now yours. I'm beginning to think God is telling me something because I've been really blessed this year. I've just not been thankful enough. Instead I've just been complaining about the things I don't have. I just might join that challenge after all. Thank you for writing this. I wish I have the diligence to carry out a challenge. I am grateful for everything that has happened to me this year. It has been a really eye-opening one for me. I don't mean to be petty,but you're a goddess,i can vividly picture how everything was like and how u must have felt,i really admire your writing skills I've been in situations when I try not to pity them cause I know if I were in their shoes I wouldn't appreciate pity either, but it's hard to see them and not feel bad for them or stare at them,I'm grateful for a lot of things,i can't begin to count but I sure have lots of things to be thankful for, Compliments of the season dear, cheers! !